275: Newbury 7:25, 6f Listed (1) "Rose Bowl Stakes"
Worth noting Rocket Rob who is dropped to a seller at Yarmouth. The majority in runners in juvenile sellers to date have been female and colts are not normally running at this level unless they obvioously belong there. The narrow and underpowered Come On Buckers is the other male in the field and physically belongs there. Rocket rob ran in a 5f maiden FTO and bumbled around at the back with two other bigger colts who you could believe would improve markedly on what they showed. One of those was Mean Mr Mustard who looks a classic Nursery winner set-up for Jamie Osborne who has made a minor place on his third run since (needed to get a Nursery run). 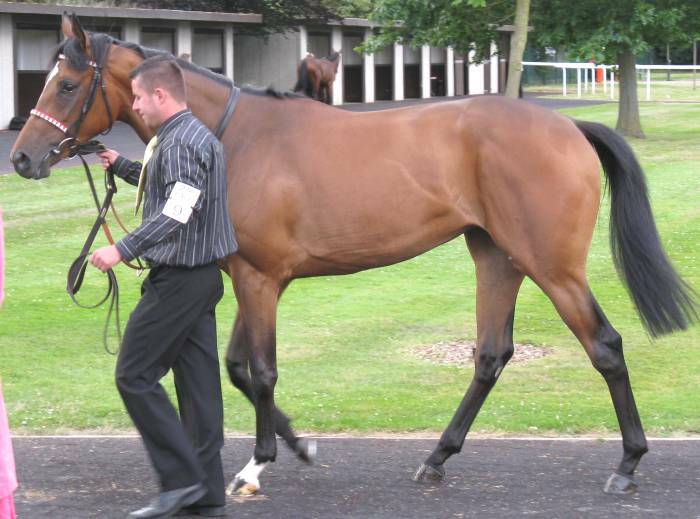 The other was Bryan Meehan's Goldvil who looked a likeable type to follow when he next runs. The B2yoR guy who was at Sandown is somewhat surprised to see Rocket Rob dropped to plating level. 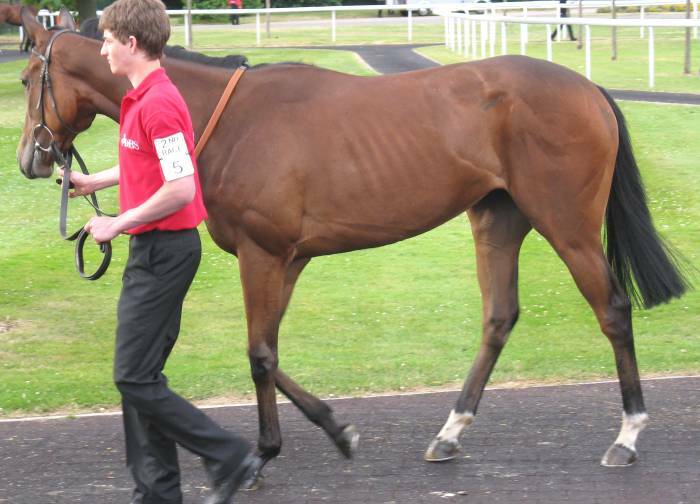 Try looking at his picture in the Virtual Paddock to see how he compares to Come On Buckers and the filly Kosama. 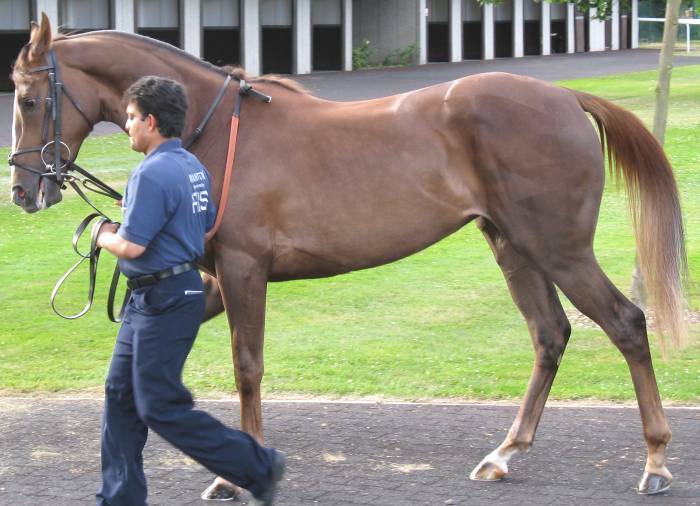 For another comparison look at this Picture of the filly Heaven Knows When who made her debut at Kempton yesterday as second string for Barry Hills with irregular rider Chris Catlin on. There's nothing of her ("..you've seen bigger donkeys on...etc") and she's as fit and ready as she can be (helped by being very sparely made) FTO. She didn't drift much from around 14/1 and that's a reflection that the race was a poor group. 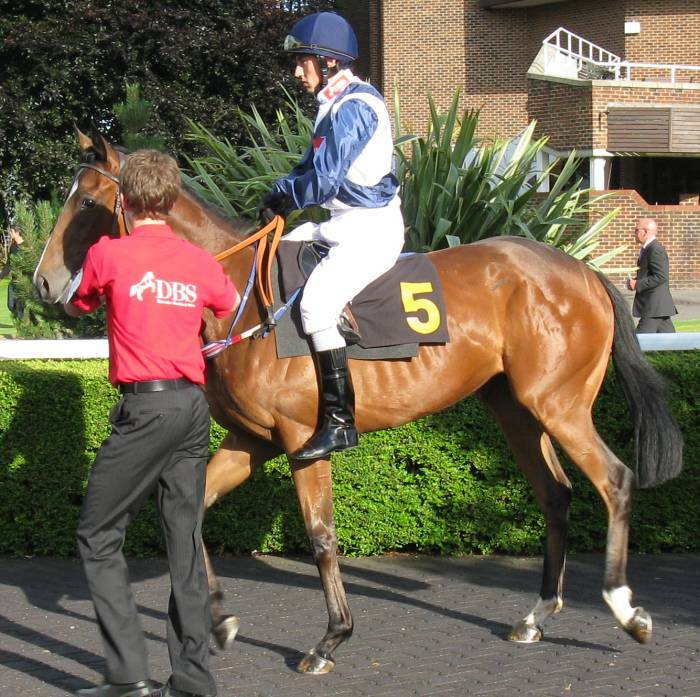 The winner Lady Cottingham (Picture) is small as well and entirely ready to run to her best and perhaps an OR72 type with a good breeze behind her. 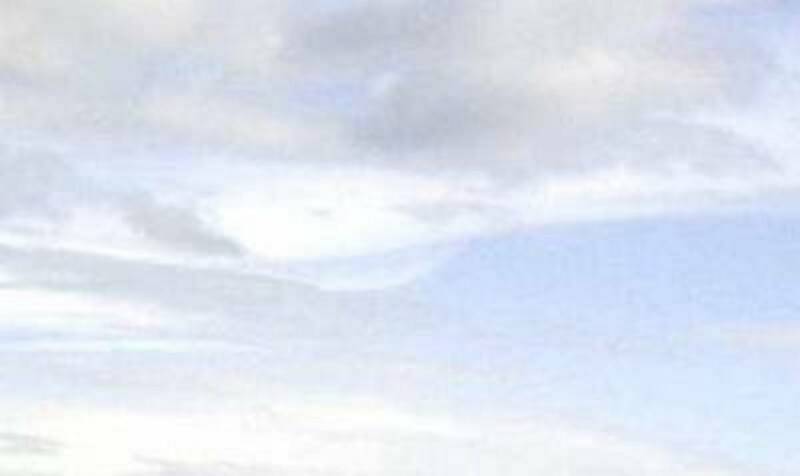 Look at this Picture of Heaven Knows When and imagine where the legs would reach to (Scooter time..) with a lankier individual aboard. The fillies with a bit more size or substance in the field finished 2nd-4th behind the well prepared & ridden Lady Cottingham and clear of the garbage. Misty Glade is an expensive purchase but has run three poor races although with excuses for the first two and improvement on the third go. She's small and that limits her but compared to LC & HKW she's solidly made (Picture) and no surprise to see her lead and it take the others some time to get to her. 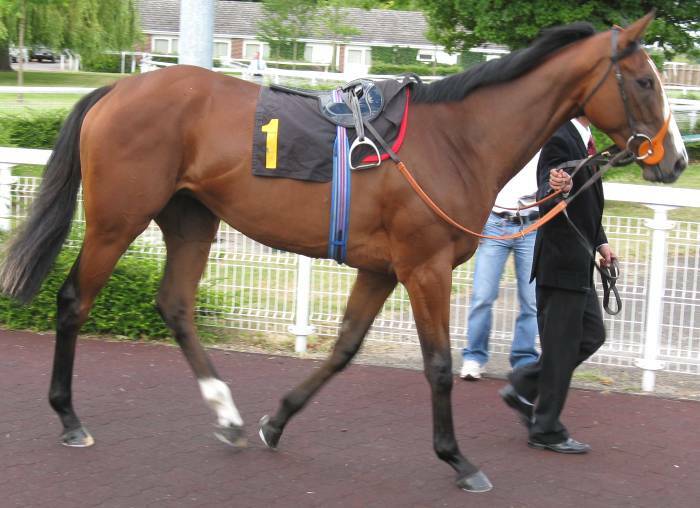 Richard Hannon's second runner Black Nun (Picture) was the tallest in the group and also well prepared but she has the proble of being narrow bodied (limits her power and makes her mor of a rangy galloper if she's anything worthwhile). She went from being excited by the new game in the pre-parade ring to overwhelmed by it in about 10 seconds and ran like it. Not getting involved until plugging on late to get to 3rd. 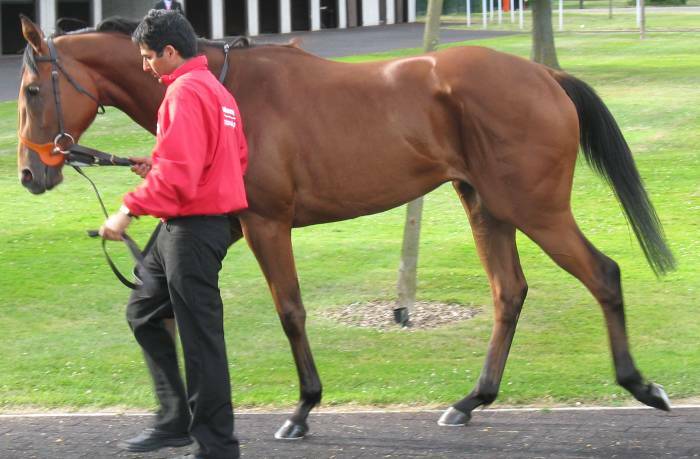 Clive Brittain usually has his horses looking in excellent condition when the stable is in form but Nashmiah looked well below average (Picture) in coat, fitness and readiness terms. On the plus side she's compact and has a bit of depth and build compared to the hat-racks in the field. The jockey said after the race that he could never get her into a rhythm and she was always pulling around and not concentrating. She moved into thrid in the straight before fading a little in the final furlong as her condition would have led you to expect.